The obvious answer to the question, "How do I grow a beard?" is to simply stop shaving, but the process can be more complicated than that. Follow my three easy tips for growing out your facial hair. Before you start to grow a beard, you should determine the type of beard you are after -- choosing the right beard for your face shape is critical. Properly shaped facial hair can really enhance your best facial features and draw attention away from weaker features. For example, a round face looks better with a beard that is longer at the chin to add length to the face and balance out the roundness. A long face benefits from a beard which is fuller at the sides and shorter at the chin. Once you know the beard you are after, the next step is to start growing it in. That's the easy part. Stop shaving for a few weeks. During this time, you should not attempt to shave or shape your facial hair, so you may end up looking a bit rough during the process. The best time to do this will be during a vacation or at a time when work does not require you to look too neat. After two or three weeks, you will be able look at the growth and determine if you have adequate coverage to grow facial hair and what shaping options are available to you. If you do not have enough coverage for a full beard, a goatee, chin strap, or soul patch may be an option. During the growing out period, you will look poorly groomed and will likely experience some itching. Keep in mind that if you want to grow a beard, this will be part of the process you will simply have to endure. To minimize itching, use a gentle shampoo and conditioner. A moisturizing lotion will also help reduce itching. To maintain a more groomed look, make sure to keep the neck shaved clean. You can also help soften the beard by using a good beard oil. 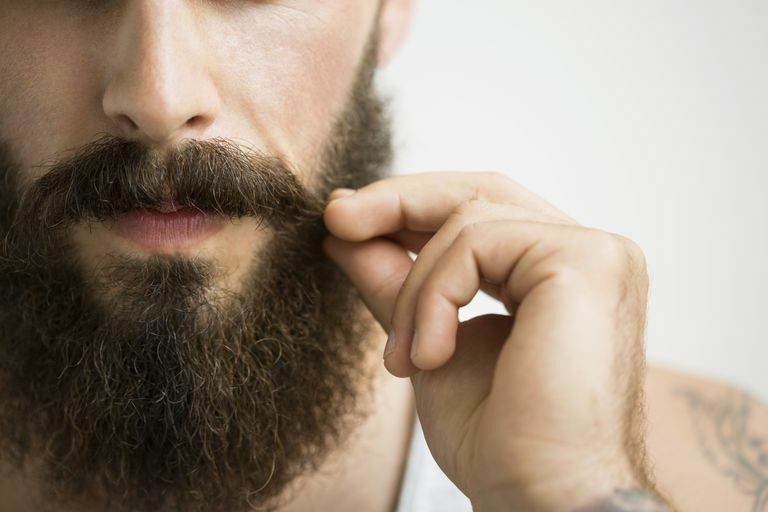 Once you've grown your facial hair for about a month, you should seek the assistance of a professional barber who can show you how to trim and shape your beard. You will need to invest in a good beard trimmer with variable length settings for home maintenance. While keeping the beard well groomed between trips to the barber is essential, leave the bulk of the trimming to the barber who really knows how to shape and groom the beard beyond just putting a guard on a clipper and buzzing it down to the same length. Growing a beard is not for all men. Some men just don't have the density of facial hair for a beard to look good. The growing out process can be itchy and a bit frustrating, but if you hang in there you may find yourself with a great new look. Once you've grown out your facial fuzz, be sure to care for your beard.